I apologize (for the second time) if this post is too long. I'm trying to explain the best I can what happened last night. 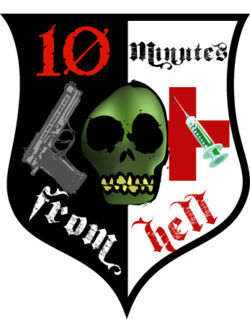 As I admitted to Lois during the application process to become a 10mfh member, I was a PKer before I joined this group. My intentions during that application process were pure- my two other alts were both PKers and I thought I'd give my Urban Dead experience some balance by playing a pro-survivor character. That, along with a belief that defending Molebank would be a fun challenge, were the reasons I joined. My belief about Molebank was mostly wrong. Felix and Elisabeth Hospital would occasionally be swarmed with zeds but it was always only one of them at a time and as long as you didn't sleep in either building, you'd be safe. There weren't many buildings to retake and zombies to shoot. Hanlon Park was operated so well that there were few people for me to revive. This was my experience in Molebank for about a month. The whole suburb was just like Hanlon Park- it was operated too well for me to do much. After a while, I simply became less active. Some days I'd log in for my other two characters and simply not log in as Dr'Lector. Playing him was dull for me. Last night, I had just finished something I'd been working on and I had nothing to do, so I went into Urban Dead. After checking a few forums and logging in as my other two characters, etc. I had nothing else to do so I finally logged in as Dr'Lector for the first time in a few days. On an impulse, I decided to Dr'Lector needed to be a PKer again. When you go from playing as a pro-survivor to a PKer, there's a change in your mentality. With my new mentality, I decided it would be fun to shock my group by killing them. And so I checked a few buildings and found CS Lewis. From there, you all know enough to finish the story. I didn't realize it when I was joining this group, but playing a pro-survivor character was an experiment for me. I hadn't played that way since 2007 and apparently it just didn't suit me anymore. PKing was just too thrilling for me to quit. As for the second part of this topic's title, I don't feel any remorse towards the actual PKing. I am sorry, however, that I betrayed the group's trust. When I was trying to join, I told Lois "I won't do any PKing and I'll follow all of your group's policies." I lied and I'm sorry for that. I have left Molebank and while there's no telling what I'll decide to do in the future, I doubt I'll be shooting anymore of this group's members. I hope there are no hard feelings towards me. LOL! Oh, dear! Please don't feel too badly about the PKings, dear. We hold no hard feelings towards you - at least I don't! It was a bit like having an associate go postal on you, is all. Not a big deal to me - though I can't speak for anyone else and I wasn't one of the people you targeted. I am glad you stopped by to explain the situation, though! I was chuckling to myself over the idea that you might have joined the group to "spy" on us before turning on us, but... we don't really have any big, dark secrets so that would have been a complete waste of time and energy to do! I am glad to know that you were sincere when you joined our group. I like to think that I read folks fairly well and was a bit concerned that my internal radar went haywire as I didn't pick up any ill intent from you at all when you joined. Now, as a long time player, I've been PKed plenty of times before - mostly for existing, I guess! It doesn't shock me at all, in fact. I'm not sure how Albert and CS may feel about it, however. If I recall correctly, I was quite upset the first time I was PKed and they may be having verydifferent - and quite valid - feelings towards you right now. I can't say I'd blame them. I do wish you'd remove our group name from your profile. As 10 minutes from hell does not PK, I don't like the idea of a PKer running around with our group name in his profile. We'd like to keep our good reputation, please. My! This has become rather lengthy! I'll stop talking here and I do hope that CS and Albert stop by to correspond a bit with you. Like I said, they may feel totally different towards you and AFAIK neither one of them has a PKer alt so they may have a different point of view! be seeing you around maybe baby. Your choice to leave the group and go to the 'Dark Side' is your own business but, and please don't misunderstand this because I really don't have any hard feelings, the manner of your departure was, ah, less than classy. You do gain back points for taking the trouble of stopping by and clearing the air by letting us know you weren't planning to do this all along (that would have been REALLY bad), and there is the whole lying thing, but to my way of thinking what you did was the equivalent of a sucker punch. Have you ever heard of fair warning? PKing is one thing, fratricide quite another. If you're still open to some advice, let me urge you not to judge all 'pro-survivor' life styles based on your experiences with us. It would be like describing an elephant as a snake because you only see its trunk. There are several different styles of pro-survivor play and while our style may be too tame for you, there are a number of other pro-survivor groups that are more action oriented. I would encourage you to give one of them a try before you give up and turn back to PKing (just not in Molebank please). Lois could probably suggest groups to look at if you're interested in it. It was good having you on the team while it lasted and I'm sorry we won't be working together any longer. As I said, no hard feelings, just don't be expecting a Christmas card (or a revive) anytime soon. I guess that since you're going off to be a PKer I shouldn't wish you good luck, but I do hope that you enjoy your choice. After all it is a game and is supposed to be fun. I wasnt too bothered to be honest, I was more curious as to why it was done than concerned with the actual event. I've never quite understood the PKer side of the game other than to annoy people, but then part of the game is that it is up to the user how they play it so each to their own. Wait...10mfh was just called a "tame" pro-survivor group. Where the f*** did the days we would storm Ridleybank for fun go to? I think what happened was a shame, but I don't have any bad feelings about it. It's a game, and people play it in many different ways. If Dr'L wants to take the PK route thats fine by me, good luck and I hope it makes the game more fun. Sometimes playing pro-survivor gets boring if you are focused in a specific area, but sooner or later a horde comes into town and kills everyone. I like the doomed-to-defeat last stand in those cases and enjoy the rebuilding process once the numbers thin. In the meantime, I continue to play the revive game. Having the social aspect of being in a group with such excellent folks as your fine selves makes the dull times much more bearable though. I don't think we were called "tame", Arc. Our situation just isn't as dangerous as it once was. Up until recently, we didn't need to leave the 'burb for action! I was referring to this. Anyway, I might be able to put something together, but I need to see how school goes before I start leading any strikes anywhere. Anyway, Dr. L', I don't have any hard feelings about you PKing the others, I understand how this kind of thing goes, and if I knew you weren't going to kill any of us, I wouldn't feel bad about dropping a needle on you. Unfortunately, with the PKer mindset going strong, who knows who you'll fancy to kill, so I'll be unable to drop a needle on you in the future. Sorry 'bout that chap. EDIT: That sounded wrong, I meant it along the context that people trust other breathers in game, and killing them just seems like its broken some type of unspoken oath. And I tend to be the kind of person who dislikes the concept of breaking any form of trust. But, I don't look down on those who aren't so...idiotic about the concept as I am. CS Lewis wrote: Your choice to leave the group and go to the 'Dark Side' is your own business but, and please don't misunderstand this because I really don't have any hard feelings, the manner of your departure was, ah, less than classy. You do gain back points for taking the trouble of stopping by and clearing the air by letting us know you weren't planning to do this all along (that would have been REALLY bad), and there is the whole lying thing, but to my way of thinking what you did was the equivalent of a sucker punch. Have you ever heard of fair warning? PKing is one thing, fratricide quite another. The lying thing I regret tremendously. That was bad of me. The lack of fair warning... I understand your point but I don't think I needed to warn you. Like I said, when you go from a survivor to a PKer there's a change in your mentality and giving a gentlemanly warning in advance before you go on your mini-killing spree just isn't as fun as going postal. I like you both, but I enjoyed PKing you and Albert and I don't think you're PKing properly if you don't get a naughty feeling when you do it. I agree that it was a sucker punch, but my goal wasn't to be honorable. It's a game and I just want to have fun. You're completely right that I shouldn't judge the pro-survivor lifestyle based on my experience in one group. It's entirely possible that another pro-survivor group would suit me and I would enjoy being in it. But for now at least, I think I'll stick to what I know and go back to PKing. The sad truth about bounty hunters is that, unless you're part of a well-known PKer group, you sort of have to go out of your way for them to target you. For a while I tried to be secretive about my PKing (this was before and not during my time in 10mfh) and until Lois reported my killings of Albert and CS, I had never been reported before. You really should give PKing a try. It is true that you'll be something of a traitor to other survivors but that sort of thing and the sheer badness are part of the appeal. Or if you want to PK without being a bad guy, become a bounty hunter. And if you do either of them, be sure to join a group. Nothing in Urban Dead is much fun solo. Eh, I know, but I have problems with these types of issues, and I'd feel like a complete jackass if I even tried it, so I'm going to try to stay away atm.